black licorice…love it, or hate it? It’s controversial, I know…there are no in-betweens.., either you like black licorice and its anise flavor, or it makes you gag! Did you trade the black jelly beans away, or did you gladly accept them for free? I’m one of those who likes the dark side. Black licorice candy=yummy! Sambuca and Galliano: great! A biscotti with a slight anise flavoring is the perfect pairing to a tall latte. Black licorice is also the ONLY candy which my family won’t eat, so I don’t have to share! However, licorice flavoring in something that isn’t a candy or liqueur is odd, and licorice medicine, what’s up with that? Let’s start with Good and Plenty…mmmm..candy shell surrounding a licorice center, and the colors are so pretty, too. What’s not to like? 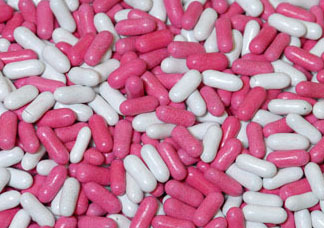 Even better, the licorice pastilles found in the Jelly Belly Bridge Mix, tiny and good! Black licorice Scotty dogs are too cute not to eat. 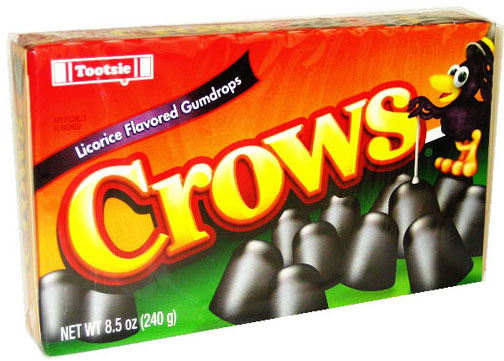 The nostalgic Crows are like licorice Dots. Trivia: if you stretch Crows out, you’ll see that they are really dark, dark, green. southern Europe, Asia and the Mediterranean. It is about 4 feet tall with purplish flowers. should limit their licorice intake. delicacy to other European nations. 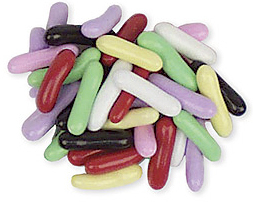 • April 12th is National Licorice Day. 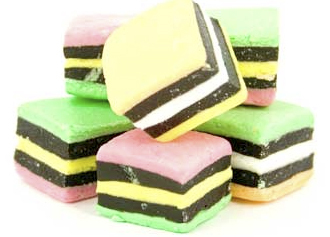 Ok, I’ll tell you what’s a licorice abomination; those licorice allsorts. I mean really, who eats that stuff? I’m testing different brands of black and red licorice. I have some new favorites that I’ll share next week. Let me know your favorites, too! somehow I will manage to soldier on if allsorts cease to exist…thanks for your great comment!